Does anyone recognise the location of this photo. Ive been told that its location is at the junction of Deptford High Street and Albury Street, and that the street sign does say Albury Street SE8 albeit this copy renders it indecipherable. I don't think it is but it could be the east end joining Church Street and Creek Road. The Pub on the right could be the "Kings Head". Photo was described as pre 1918 but the car boot just showing at the right seems a later model than 1918. I was thinking about 1935 to 1940's Any suggestions would be welcome. Hello Andy, you are correct- 1901 census has Mr Osman, Pawnbroker, working from his shop at 185/7 Church St. which was on the corner of Albury St.
PS.Are you sure its a car? I have played arouund with pic in photoshop.and though its still open to interpretation,mine would be a man pushing a barrow.....who knows. My typo sorry....it is Osment. Photos of the Kings Head Pub are very scarce. Hi, the photo brings many memories. I recognise it as exactly as it was around approx. 1947. Mr. & Mrs. Gray ran the Newsagents and Tobacconists next door in Church Street and the St. Nicholas Church Hall was opposite where we used to go to Sunday School because the Church on Deptford Green was bombed in the war. I walked past Osments the Pawnbrokers everyday on my way to Frankham Street School. Thanks for your story. Its nice to hear memories about this area. Was the news agents called "Maynards"? I use to spend a fair few of my growing up years in Albury St. Sorry I can't remember the name of the Newsagents. Just that Mr. & Mrs. Gray used to run it. Was there an entrance to the Albany Institute in Albury Street? We used to tag along with Granny to the elderly peoples' club in the Albany in Creek Road. They hired a coach and we all went to the Festival of Britain on Deptford Night - needless to say it rained all night and all we saw was Deptford in lights. Yes there was a entrance from Albury St. Can you tell me what was the building past the newspaper shop. The ornate building very similar to the Albany Institute. We use to walk past the shop turn right through a gate into St Pauls and there used to be a wreck or play area with slide and swings R/Abouts etc. Can you remeber this area? Can't remember the ornate building but we used to walk through to St. Paul's and play in the Rec. I wonder if you can still walk through to the High Street. 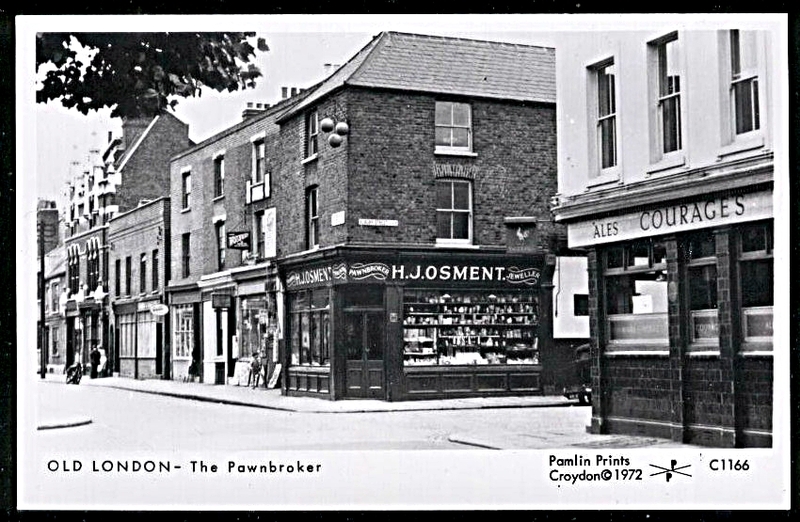 When you got to the High Street on the left was a shed-like building which was the Co-op and the tea, sugar etc. was served up in newspaper cones. No packaging in those days! I now own the photo in question and can confirm that the street sign does actually say "Albury St SE8". The Kings Head pub (demolished for road-widening in the late 70s or early 80s) was also known by many Deptfordians as The Blue Lamp. The name seems to have originated when the owner or manager, not having an ordinary light bulb, used a blue one instead for the external light. According to the 1914 Post Office Directory there was a Unitarian Baptist Church along that row. The other shops mentioned in the directory would appear to be too small to warrant such an ornate building. Correction: the Unitarian Baptist Chapel was further down Church Street, opposite Berthon Street. The building in question increasingly looks like a pub, but the 1914 map does not show it, and the Post Office Directory of 1914 does not list it. thats some great info! thanks and a happy new year to you. Hi Andy,Iwould like to revise my last post....I have just realised that the Osment shop, "sticks out" more than the others in the row,and this means that one shop is hidden behind it.this means that my count was wrong and the ornate building is No 181: No 183 is the shop next door. this was not recorded on 1911 census maybe because it was enpty at that time. See what you mean Ron...I never notice the recess either. Going by your info I have to agree with your numbering. I also heard that the building was a shoe menders as well but it does seem a bit grand for such a business. Hello Andy, I'm an old deptfod boy (Watergate st 1939) I have some photos of the Kings Head area if your interested circa 70s' before road widening, I can e-mail to you if you like. Form one Deptford Lad to another I would be veryinterested in the photos you have. Can you scan them and send to axelgs1@yahoo.co.uk please. Photos of this area are rare especially the Kings Head area and Watergate Street. I hope you like the site and any time you have any memories about the area I and the Deptford community would be glad to hear them.